There are two different approaches concerning the effects of vocational training/education (VTE) services delivered by business organisations on employees’ leaving tendencies. The positive approach, which is empirically well-supported as well, indicates that the VTE activities lead to increases in organisational commitments of employees. The negative approach, which is mostly restricted to theoretical explanations, predicts that the VTE services offered to employees charge high turnover-related new costs to organisations by increasing the leaving tendencies of employees. Even there are studies supporting both approaches in the global literature, the studies on Turkey seem to be ignoring the unfavourable impacts of VTE services. For the purpose of highlighting this negligence, utilising a sample of businesses those have been operating in Turkey’s manufacturing sectors and somewhat have provided a VTE opportunity to their employees, this study examines whether or not the VTE activities of organisations influence employees’ tendencies to leave current organisations for others. Results from several analyses based on a data set collected from 198 employees working in 25 businesses reveal that VTE programs do not cause any increase in employee leaving tendency, rather, it is found that the increases in the levels of organisational support for training and employee satisfaction with training tend to reduce the tendencies of employees to leave their organisations. Besides, a significant positive relationship is found between enthusiasms of employees for VTE and their leaving intentions. Overall results support the premise suggesting that VTE services benefit both employees and employers and thus the study underlines that the human resources departments in businesses need to enforce more VTE practices. İş örgütlerinin sunduğu mesleki eğitim/öğretim (MEÖ) hizmetlerinin, çalışanların örgütlerini terk etme eğilimine etkisi üzerine iki farklı görüş bulunmaktadır. Ampirik olarak daha çok desteklenen olumlu yaklaşım, örgütlerin sağladığı MEÖ faaliyetlerinin, çalışanların örgütsel bağlılığını artırdığını ortaya koymaktadır. Daha çok teorik açıklamalarda yer verilen olumsuz yaklaşım ise, çalışanlara sunulan MEÖ hizmetlerinin onların işletmeyi terk etme eğilimlerini artırarak örgütlere, yüksek işgücü devrine bağlı yeni maliyetler yüklediğini savunmaktadır. Küresel yazında, her iki yaklaşımı da destekleyen çalışmalar bulunmakla birlikte, Türkiye üzerine yapılan çalışmalarda, MEÖ hizmetlerinin muhtemel olumsuz etkilerinin dikkate alınmadığı görülmektedir. Bu eksikliğe dikkat çekmeyi amaçlayan bu çalışma, örgütlerin sunduğu MEÖ faaliyetlerinin, çalışanların başka işletmelere yönelme eğilimini etkileyip etkilemediğini, Türkiye’nin imalat sanayii sektörlerinde faaliyet gösteren ve bir şekilde çalışanlarına MEÖ hizmeti sunmuş işletmeler örneğinde incelemektedir. Seçilen 25 işletmedeki 198 çalışandan elde edilen anket verileri ile yapılan farklı analiz sonuçları, MEÖ programlarının çalışanların işletmeyi terk etme eğilimini artırmadığını, aksine mesleki eğitim/öğretime örgütsel destek ve çalışanların mesleki eğitim/öğretimden tatmin düzeylerinin, çalışanların örgütlerini terk etme eğilimini azalttığını ortaya koymaktadır. Üstelik, çalışanların MEÖ isteği ile işletmelerini terk etme eğilimleri arasında anlamlı bir pozitif ilişki bulunmuştur. Tüm sonuçlar, MEÖ faaliyetlerinden hem işveren hem de çalışanların kazançlı çıkacakları hipotezini desteklemekte ve işletmelerdeki insan kaynakları birimlerinin MEÖ faaliyetlerini artırmalarının gerekliliğini ortaya koymaktadır. Aberdeen Group (2012). Learning for Long-Term Success: Investing in Workforce Management Training and Education. Analyst Insight, Aberdeen Group, https://www.kronos.co.uk/resources/aberdeen-analyst-insight-learning-long-term-success-investing-workforce-management adresinden 19 Temmuz 2017 tarihinde erişildi. Arnold, J. & Feldman, D. C. (1982). A Multivariate Analysis of The Determinants of Job Turnover. Journal of Applied Psychology, 67(3), 350-360. Arnold, J. & Davey, K. M. (1999). Graduates’ Work Experiences as Predictors of Organisational Commitment, Intention to Leave and Turnover, Which Experiences Really Matter? Applied Psychology, 48 (2), 211-238. Becker, G. S. (1993). Human Capital: A Theoretical and Empirical Analysis with Special Reference to Education (3rd Ed. ), Chicago, IL: University of Chicago Press. Becker, T. E. & Billings, R. S. (1993). Profiles of Commitment: An Empirical Test. Journal of Organizational Behavior, 14, 177-190. Becker, T. E., Billings, D. M., Eveleth, D. M. & Gilbert, N. L. (1996). Foci and Bases of Employee Commitment: Implications for Job Performance. Academy of Management Journal, 39, 464-482. Benkhoff, B. (1997). Ignoring Commitment Is Costly: New Approaches Establish the Missing Link Between Commitment and Performance. Human Relations, 50(6), 701-726. Brum, S. (2007). What Impact Does Training Have on Employee Commitment and Employee Turnover? http://www.uri.edu/research/lrc/research/papers/Brum-Commitment.pdf adresinden 18 Ağustos 2017 tarihinde erişildi. CEDEFOP-European Centre for the Development of Vocational Training (2012). Sectoral Perspectives on The Benefits of Vocational Education and Training, Research Papers, 22, Luxembourg: EU Publication. Cheng, E. W. L. & Ho, D. C. K. (2001). Research Note: A Review of Transfer of Training Studies in The Past Decade. Personnel Review, 30(1), 102-118. European Training Foundation (2014). Skills Vision 2020 Turkey. https://abdigm.meb.gov.tr/projeler/ois/egitim/028.pdf adresinden 7 Ağustos 2017 tarihinde erişildi. Felps, W., Mitchell, T. R., Hekman, D. R., Lee, T. W., Holtom, B. C. & Harman, W. S. (2009). Turnover Contagion: How Coworkers’ Job Embeddedness and Job Search Behaviors Influence Quitting. Academy of Management Journal, 52(3), 545-561. Green, F., Felstead, A., Mayhew, K. & Pack, A. (2000). The Impact of Training on Labour Mobility: Individual and Firm-Level Evidence from Britain. British Journal of Industrial Relations, 38(2), 261-275. Gürbüz, A. (2007). An Assesment on the Effect of Education Level on The Job Satisfaction from The Tourism Sector Point of View. 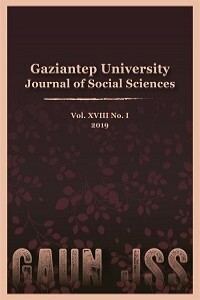 Doğuş University Journal, 8(1), 36-46. Hazucha, J., Hezlett, S. & Schneider, R. (1993). The Impact of 360-Degree Feedback on Management Skills Development. Human Resource Management Journal, 32(2), 325-351. He, P., Findley, H. & Wheatley, R. (2017). The Effects of Training on Job Satisfaction and Service Quality Among Temporary Employees: The Mediating Role of Affective Commitment. Journal of Management and Marketing Research, 21. Kalkavan, S. & Katrinli, A. (2014). The Effects of Managerial Coaching Behaviors on the Employees’ Perception of Job Satisfaction, Organisational Commitment, and Job Performance: Case Study on Insurance Industry in Turkey. Procedia-Social and Behavioral Sciences, 150 (2014), 1137-1147. Kapp, K. M. (1999). Transforming Your Manufacturing Organization into A Learning Organization. Hospital Material Management Quarterly, 20(4), 46-55. Khatri, P. & Gupta, P. (2015). Correlates of HRM Practices and Organisational Commitment of Retail Employees in Delhi-NCR. Asia-Pacific Journal of Management Research and Innovation, 11(2) 95-107. Doi: 10.1177/2319510X15576177. Konings, J. & Vanormelingen, S. (2010). The Impact of Training on Productivity and Wages: Firm Level Evidence. The Institute for the Study of Labor (IZA) Discussion Papers, 4731, http://ftp.iza.org/dp4731.pdf adresinden 14 Ağustos 2017 tarihinde erişildi. Lindbeck, A. & Snower, D. J. (2001). Insiders versus Outsiders. The Journal of Economic Perspectives, 15(1), 165-188. Mowday, R.T., Steers, R.M. & Porter, L.W. (1979). The Measurement of Organizational Commitment. Journal of Vocational Behaviour, 14: 224-247. Owens, P. L. (2006). One More Reason Not to Cut Your Training Budget: The Relationship Between Training and Organizational Outcomes. Public Personnel Management, 35(2), 163-172. Schmidt, S. W. (2004). The Job Training and Job Satisfaction Survey: Technical Manual. http://files.eric.ed.gov/fulltext/ED494451.pdf adresinden 11 Temmuz 2017 tarihinde erişildi. SHRM-Society for Human Resource Management (2012). 2012 Employee Job Satisfaction and Engagement: How Employees Are Dealing with Uncertainty. https://www.shrm.org/ResourcesAndTools/tools-and-samples/policies/Documents/12-0537%202012_jobsatisfaction_fnl_online.pdf adresinden 7 Ağustos 2017 tarihinde erişildi. SHRM-Society for Human Resource Management (2015). Employee Job Satisfaction and Engagement: Optimizing Organizational Culture for Success. http://www.shrm.org/Research/SurveyFindings/Documents/2015-Job-Satisfaction-and-Engagement-Report.pdf adresinden 7 Ağustos 2017 tarihinde erişildi. SHRM-Society for Human Resource Management (2016). Employee Job Satisfaction and Engagement: Revitalizing A Changing Workforce, https://www.shrm.org/hr-today/trends-and-forecasting/research-and-surveys/Documents/2016-Employee-Job-Satisfaction-and-Engagement-Report.pdf adresinden 7 Ağustos 2017 tarihinde erişildi. Steers, R. M. (1977). Antecedents and Outcomes of Organizational Commitment. Administrative Science Quarterly, 22(1), 46-56. Tamkin, P. (2005). Measuring the Contribution of Skills to Business Performance: A Summary for Employers. Brighton: Institute for Employment Studies. UNSTAT (2017). http://unstats.un.org/unsd/cr/registry/regcst.asp?Cl=14 adresinden 18 Temmuz 2017 tarihinde erişildi. UNCTADSTAT (2017). http://unctadstat.unctad.org/EN/Classifications/DimSitcRev3Products_Tdr_Hierarchy.pdf adresinden 18 Temmuz 2017 tarihinde erişildi. WB-The World Bank (2013). Turkey: Evaluating the Impact of ISKUR’s Vocational Training Programs. Human Development Sector Unit Reports, 82306-TR, Washington, DC: WB.